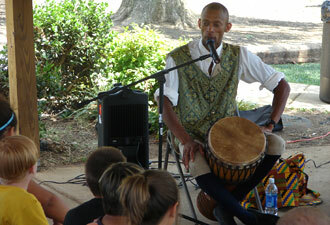 Chetter Galloway shares traditional slave stories with children during an Emancipation Day celebration. Homepage photo: Exterior view of the Andrew Johnson National Historic Site. 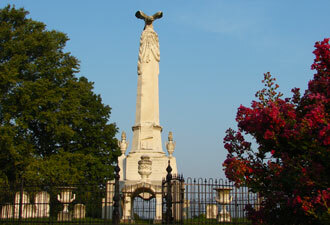 Greeneville, Tennessee is a must-stop destination for anyone interested in the Civil War or presidential history. 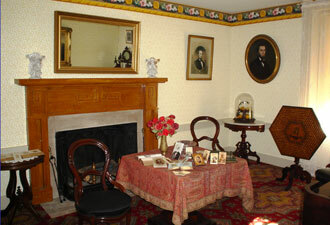 Andrew Johnson called this small east Tennessee town home most of his life, and it remains an ideal place to explore the stories of the antebellum South, the Civil War, and the era of Reconstruction. Come with an open mind and challenge yourself to set aside accepted beliefs. Put yourself in that turbulent time and place and see what you believe about the many controversies surrounding the 17th president of the United States. As you walk in Andrew Johnson's footsteps, you'll trace the path of a man who served in pivotal roles during the mid-19th century. Andrew Johnson was a U.S. senator, military governor of Tennessee, and vice president of the United States during the Civil War. Lincoln's tragic assassination thrust the tailor-turned-politician into the executive office during Reconstruction. Strict Constitutional adherence guided President Johnson's political decisions and led to many legislative vetoes that seem otherwise unexplainable today. The battles he fought with Congress impact the country even now. Engaging daily activities at the historic site include touring two homes of the former president, seeing the tailor shop where he honed his debating skills, and enjoying a museum filled with original presidential artifacts. Learn how Johnson championed education, the Homestead Act, and the purchase of Alaska. Vote on Johnson's guilt or acquittal with a replica admission ticket to his impeachment trial. Did you know impeachment doesn't mean removal from office? Removal occurs if there is a conviction after a Senate trial — in 1868 Johnson was acquitted by one vote! Children and students can become National Park Service stewards and receive a badge when they complete a Junior Ranger workbook. School programs are available for students off- and on-site. Favorite activities include practicing the tailor's trade as children try on vintage-era recreated clothes, lift the heavy iron called a “goose,” or make their own “Junior Tailor” vest. Every year on August 8th Andrew Johnson National Historic Site celebrates “Emancipation Day,” formally recognized by the Tennessee legislature as the day that Andrew Johnson freed his personal slaves in 1863. The site also reenacts the 1864 anniversary of Johnson’s “Moses Speech,” when, as military governor, he freed all slaves in Tennessee. The national cemetery is one of only two active cemeteries administered by the National Park Service. In 1875, Johnson was buried atop Signal Hill; it remained a family burial place until Johnson's daughter's death in 1902. Her wish that it become an honorable place for veteran interments was realized in 1906 when the War Department gained management of the property. The cemetery was transferred to the NPS in 1942. Andrew Johnson National Historic Site hosts a solemn and impressive annual Memorial Day service in May. Each December the site honors American veterans with a Wreaths Across America ceremony.